What are the five to ten most common or most troublesome weeds in the farm’s primary crops? 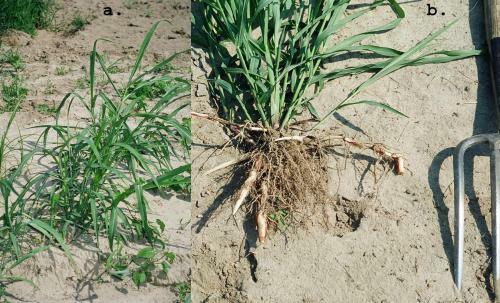 Be sure to identify these correctly; two weeds that look very similar may have very different life histories, means of propagation, susceptibilities to cultivation and other management tactics, and impacts on the crop. Which ones are predominant at different times of the year? What fields or beds have the worst weed problems? What is their management history? Which fields are cleanest or least weedy? What is their history? What is the weed's life cycle? At what time of the year does it emerge? From what depth does it usually emerge? When and how does it most interfere with crop production? When and how does it reproduce? How are its seeds, or its tubers, roots, rhizomes, or other vegetative reproductive structures, spread? How long can the seeds remain viable in the soil? What are the main triggers for germination? What soil conditions seem to promote or inhibit it's growth? How does it respond to soil nutrient levels and forms of fertilizer? What are the weed’s tolerances to drought, shading, temperature extremes, and other stresses? How is the weed or its seeds/propagules affected by various kinds of disturbance, such as mowing, chopping, severing, uprooting, burial, or being brought to the surface? Does the weed seem particularly aggressive against certain crops? Is it inhibited by the presence of certain other crops? What practices or aspects of the farm’s current cropping system seem to encourage the weed or provide it a niche to exploit? What “windows of vulnerability” in the weed’s growth habit, life cycle, or responses to environmental cues provide opportunities for prevention or control? Monitor fields regularly throughout the season, and year after year. In addition to providing more information on the existing weed flora and how it responds to prevention and control measures, careful monitoring can detect the arrival of new weed species before they spread and become major problems. This is especially important for those organic farmers who utilize manure, mulch, hay, and other organic materials from off-farm sources, or who have custom operators provide certain services, such as primary tillage or harvesting. Knowledge of a weed's life cycle and modes of reproduction is especially important in designing effective prevention and control strategies. Weeds can be classified into several major groups based on their life cycles. Summer annual weeds are those that germinate, grow, and complete their life cycle within the frost-free period of a single growing season. Most summer annuals are frost-tender and will die with the first fall frost. They are characterized by rapid growth, and often respond to high levels of soluble nutrients; they can compete intensely with crops by appropriating soil nutrients and moisture, and by outgrowing and casting shade on slower-growing crop plants. They reproduce almost entirely by seed, although broken fragments of shoots of a few species, such as common purslane, can reroot and grow into new individuals. Three subgroups of summer annual weeds can be recognized. Small-seeded summer annual broadleaf (dicot) weeds emerge from seeds at or relatively near the soil surface (mostly from the top inch of soil), grow rapidly, and produce prolific amounts of seed within a single season. They are often major weeds in vegetable crops. The seeds usually germinate in response to one or more stimuli associated with soil disturbance, such as light and increased concentrations of nitrate N. When buried deeper in the soil, the seeds of many of these weeds remain dormant but viable for years, germinating when brought to the surface again by tillage. A few, such as galinsoga, have short-lived seeds that will deteriorate when buried. 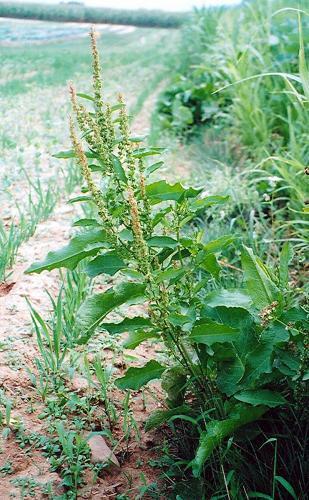 Examples of small-seeded summer annual broadleaf weeds include pigweeds (Fig. 1), common lambsquarters (Fig. 1), common purslane, galinsoga, and smartweeds. 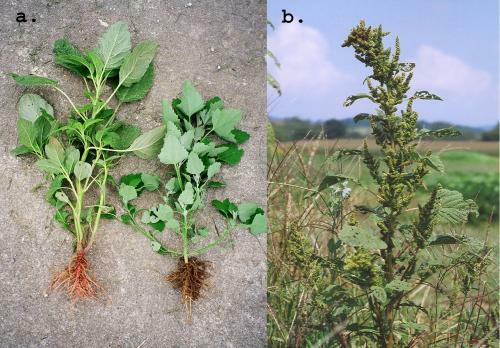 Figure 1. a) Redroot pigweed, Amaranthus retroflexus (left), and common lambsquarters, Chenopodium album (second from left) are small-seeded summer annual broadleaf weeds. b) One large mature pigweed plant (right) can shed at least 100,000 mature seeds, and one lambsquarters more than 50,000. Photo credits: Mark Schonbeck, Virginia Association for Biological Farming. Large-seeded summer annual broadleaf (dicot) weeds emerge from slightly deeper in the soil profile (typically 0.5–2 inches), grow rapidly, compete aggressively with crops, and set seed within a single season. They often become major weeds in conventionally tilled agronomic crops like corn, but they may also occur in vegetables. Seed production is less prolific (a few hundred to a few thousand per plant) but seeds of some of these weeds may survive for decades in the soil. 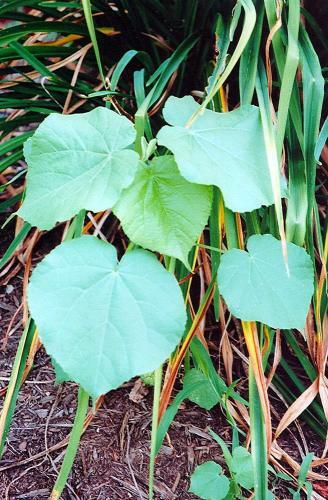 Examples include velvetleaf (Fig. 2), common cocklebur, and morning glory. Figure 2. Velvetleaf, Abutilon theophrasti, a large-seeded summer annual broadleaf weed with relatively long-lived seeds. Photo credit: Mark Schonbeck, Virginia Association for Biological Farming. Summer annual grass (monocot, family Poaceae) weeds have small to medium sized seeds that emerge mostly from the top inch or so, and may or may not show a germination response to light. These weeds grow rapidly and reproduce through prolific seed set. They are associated with shallow tillage and reduced tillage systems. 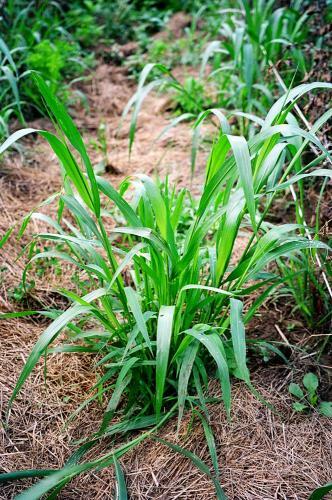 Examples include crabgrass (Digitaria spp. ), goosegrass (Eleusine indica), foxtails (Fig. 3), and fall panicum (Panicum dichotomiflorum). Figure 3. Giant foxtail, Setaria faberi, a summer annual grass weed. Photo credit: Mark Schonbeck, Virginia Association for Biological Farming. Winter annuals emerge in late summer or fall and are winter hardy in all but the coldest parts of the United States. In cool–temperate regions like the mid-Atlantic and southern New England, they typically overwinter as low, compact plants or rosettes, resume growth in late winter or early spring, form one or more flowering shoots or stalks, and reproduce by seed in late spring or summer of their second season. In warmer climates from the Gulf Coast up into Oklahoma, they may grow actively through the winter. 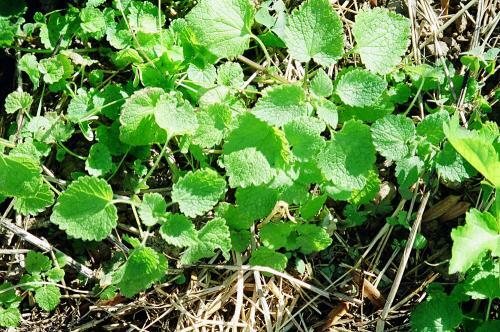 These weeds are most problematic in winter and early spring vegetables and in winter grains; they have little direct effect on warm season crops. Examples include wild mustards, common chickweed, horseweed, henbit, and purple deadnettle (Fig. 4). Figure 4. Purple deadnettle, Lamium purpureum, a common winter annual weed, emerges and becomes established in late fall or early spring. These plants will form vertical stalks of purple mint-like flowers in mid to late spring. Photo credit: Mark Schonbeck, Virginia Association for Biological Farming. Biennial weeds germinate and grow vegetatively during one growing season; go dormant overwinter as a hardy rootstock; and bolt, flower, and form seed in the spring or early summer of their second year. Their lifecycle is similar to the winter annuals except that they can begin growth early in their first season, live somewhat longer than a full calendar year, and form heavier taproots than most winter annuals. They also share many characteristics of the simple or stationary perennials (see below), with which they are sometimes grouped. In the second spring, biennial weeds grow vigorously, sending up flowering shoots two to six feet tall. Examples include burdock and wild carrot (Fig. 5). Figure 5. 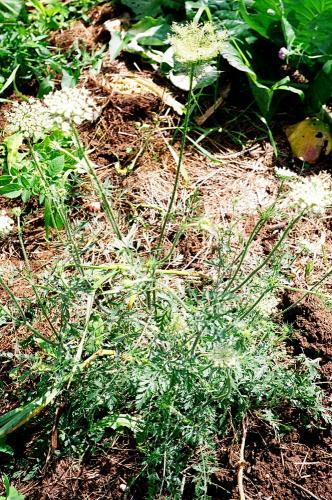 Wild carrot, Daucus carota, also known as Queen Anne's lace, is a biennial that remains vegetative and forms a deep taproot during its first growing season. The following spring, it sends up the white umbel inflorescence shown here. Photo credit: Mark Schonbeck, Virginia Association for Biological Farming. Simple perennials or stationary perennials typically have deep, heavy taproots (most broadleaf species) or strong fibrous root systems (grasses, plantain) from which the plant regenerates after the top is destroyed by mowing, cultivation, or winter freezes. These weeds reproduce by seed shed annually from mature plants. Seedlings grow slowly at first, then become strong competitors once established. Simple perennials are most problematic in pastures and perennial crops, though they sometime occur in reduced-tillage annual cropping systems. The lifetime of an individual plant is usually several years. Examples include broadleaf dock (Fig. 6), curly dock (which may grow as a biennial in some areas), dandelion, chicory, and tall fescue. Figure 6. Broadleaf dock, Rumex obtusifolius, a simple perennial with a deep, heavy, winter hardy taproot, from which the weed's foliage and flower stalk emerge each growing season. Photo credit: Mark Schonbeck, Virginia Association for Biological Farming. Invasive perennials—also known as wandering or spreading perennials—reproduce by one or more types of vegetative structures such as stolons (prostrate stems along soil surface), rhizomes (belowground, root-like stems), bulbs, and tubers, as well as by seed. Stolon or rhizome fragments as small as one inch long can regenerate new individuals, often from depths of 3–12 inches. Thus, a single tillage pass may simply spread propagule of these weeds. The lifetime of an individual plant is long and difficult to delineate owing to its vegetative propagation. Many of our most serious weeds are in this category. Examples include johnsongrass (Fig. 7), Bermuda grass, quack grass, nutsedges, horsenettle, milkweed, bindweeds, and Canada thistle. Figure 7. Johnsongrass, Sorghum halepense, a wandering perennial that reproduces through thick, fleshy rhizomes. Photo credit: Mark Schonbeck, Virginia Association for Biological Farming.